Homeplan Designs, A Lytham Design Firm, Starts New Rest Home Extension Project. Chris Sinkinson of Homeplan Designs, an architecture consultancy firm in Lancashire, begins design of a rest home extension. It will provide more capacity so the owner can accommodate clients currently on a waiting list. 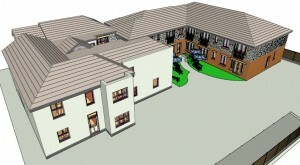 3D rendering of a rest home by Lytham designer Chris Sinkinson. Lancashire home designerChris Sinkinson has commenced work on another project for one of his long-standing clients. Sinkinson will be extending one of the existing rest homes to provide extra bedrooms with all the required ancillary facilities. He was a natural choice for this project based on his lengthy experience designing rest home expansions. Chris Sinkinson is the head designer and owner of Homeplan Designs. They specialize in the planning and design of rest and nursing homes in Northwest England, as well as working on residential extensions, remodels and new build projects. One of the main reasons Chris was chosen for this rest home extension was that he and his client work very well together. In the past Chris would visit the properties his client was thinking of purchasing to determine if they were in reasonable condition and if in fact they had the scope to be expanded. His client feels he has more than enough rest homes to manage on his own, but he is still getting numerous inquiries from people who would like to become residents of his excellent facilities. These people would go on his already long waiting list, because he simply has not had the rooms available to accommodate all of the people who wanted to live there. This is why he made the wise decision of contacting Chris to see if his existing facilities could be expanded, and done so with very high standards. When walking into a new section of one of the buildings, his client wants it to feel like entering an upmarket hotel, not a hospital wing. Many of his client’s rest home acquisitions over the years had been acquired with the thought of a possible future extension. This means that there is definitely scope to provide floor layout designs which should be approved by the relevant council planning departments. Chris has produced a layout scheme for the first rest home extension, which will be taken through the planning process. He looks forward to working on his client’s other properties. Chris Sinkinson is the owner of Homeplan Designs, an Architectural Consultancy Firm in Lytham, Lancashire. Homeplan Designs undertakes all types of Domestic, Shopfitting & Commercial projects in the Northwest of England and throughout the UK. He can be contacted for advice on the possibilities of extending a rest home or nurse home. This press release was prepared by Bobrow Consulting Group (BCG) for Homeplan Designs. BCG works with building design professionals to build their business by optimizing their online strategy, teaching marketing for architecture firms as well as offering web design and SEO consulting services.